Please understand that these are not stock designs; each is individually digitized upon ordering. Once you have placed the order, the turn-around time until you receive your customized badge will be approximately 3-5 business days. Note: I can provide most embroidery formats except ART, which is not available at this time. Because different versions exist of most family iconography, I encourage you to e-mail me an image of your preference before I begin. When ordering, please indicate desired embroidery format in the "Instructions to Merchant" field on the PayPal checkout page or e-mail me directly. You will receive your custom-digitized design by e-mail attachment in 3-5 business days. You are purchasing embroidery designs, not patches! 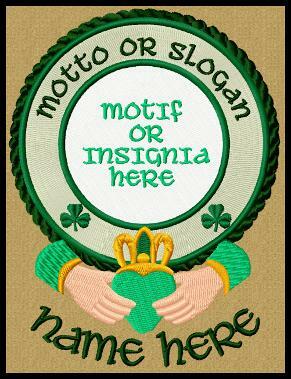 Stitched claddagh badge measures approximately 5.0"w x 6.9"h (131 x 175mm) and will stitch in a 5x7" hoop (130x180mm). Stitched claddagh badge measures approximately 4.4"w x 5.9"h (110 x 150mm) and will stitch in a 5x7" hoop (130x180mm). Stitched claddagh badge measures approximately 3.7"w x 4.9"h (90 x 124mm) and will stitch in a 5x7" hoop (130x180mm). Stitched claddagh badge measures approximately 2.9"w x 3.9"h (72 x 99mm) and will stitch in a 4x4" hoop (100x100mm). The distinctively Irish claddagh design incorporates a traditional round badge style featuring the clan or family insignia and motto (if applicable), along with symbols denoting loyalty (crown), friendship (hands), and devotion (heart). The design features the family name or motto on the circular band, with additional text (name, motto, or location) shown below if desired. Changing the color scheme dramatically alters the appearance of the claddagh badge. Colors in the samples have been selected to complement the clan insignia. It takes about 15 hours to create each claddagh badge.